Sunday, I chopped up the two massive turkeys Mark and I had been given for our labors the day before. Each turkey will make four big meals --- one meal of the drumsticks, two more from the two halves of the breast, and a fourth meal from making soup out of the back. I have a lot of poultry recipes to choose from, but with nice young birds I tend to fall back on my roast chicken recipe. I roasted the drumsticks, then on Monday turned some of the copious leftovers into Curry Chicken Pot Pie. 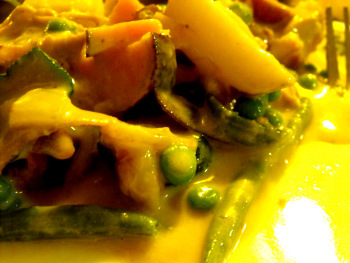 Until I tasted this recipe, I didn't think I liked curry, but the curry is a perfect match for lightly steamed vegetables and fresh chicken or turkey --- and it makes the dish a beautiful brilliant yellow! I highly recommend you check it out as a post-Thanksgiving use for leftover turkey.